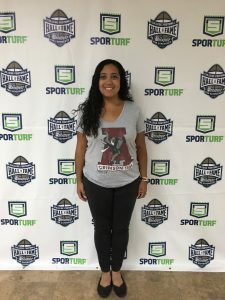 Sporturf™ Business Director Matt Riggs is pleased to announce that Chelsey Keeton has joined the Sporturf™ team in the position of Lead Generation Coordinator. “I am excited to have Chelsey join the Sporturf™ team. She brings exceptional customer service, experience and sports knowledge to our team,” said Riggs. Chelsey graduated in 2015 from The University of Alabama with a Bachelor’s of Science in Business Management. Chelsey’s interests include reading, exercising and enjoying Alabama football on the weekends. She is engaged and currently planning for a wedding in the fall of 2017. As Lead Generation Coordinator Chelsey will be monitoring potential projects and working with architects and engineers to get Sporturf™ dealers approved to bid. Sporturf is proud to have Chelsey in such a pivotal role.